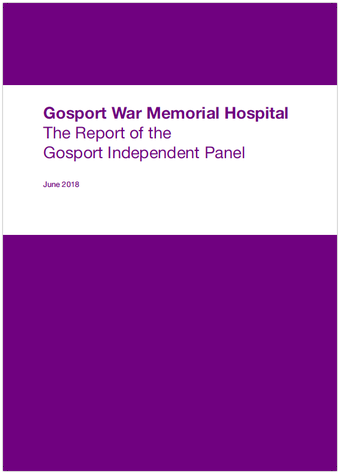 The Gosport Independent Panel was set up to address concerns raised by families over a number of years about the initial care of their relatives in Gosport War Memorial Hospital and the subsequent investigations into their deaths. This website contains the Panel’s Report as well as an online archive of documents obtained and examined by the Panel and other documents created by the Panel to assist its work. The Report is an in-depth analysis of the Gosport Independent Panel’s findings. It explains how the information reviewed by the Panel informed those findings and illustrates how the disclosed documents add to public understanding of events at the hospital and their aftermath. To obtain further information, see the link below. The Gosport Independent Panel has had access to over 100,000 documents and has itself created many others to manage its work. Most of these documents are published in this library. Where documents such as official medical records and death certificates were made available to the Panel, these have not been included in the library. Where appropriate and with the consent of the families concerned, extracts may appear within other documents in the library. Personally sensitive documents and information have been withheld from publication unless already in the public domain. However, these will of course be made available to families should they wish to have access to them.